This serves as an intensive exercise of matplotlib’s transforms and custom projection API. 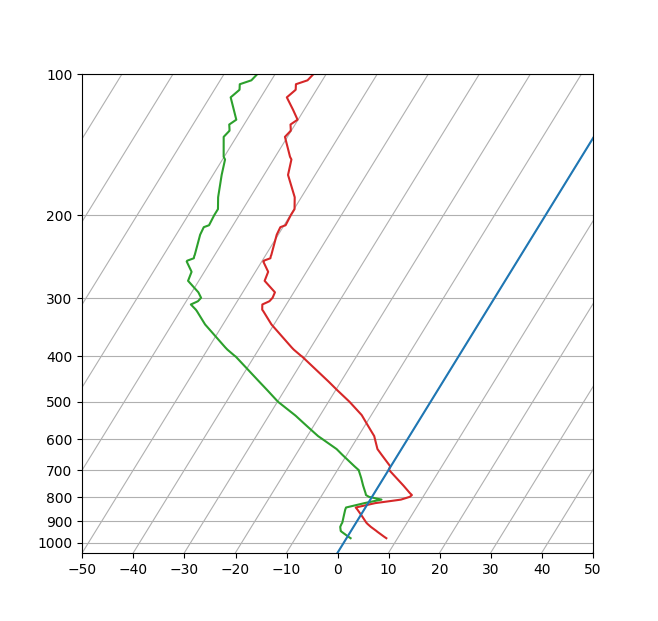 This example produces a so-called SkewT-logP diagram, which is a common plot in meteorology for displaying vertical profiles of temperature. As far as matplotlib is concerned, the complexity comes from having X and Y axes that are not orthogonal. This is handled by including a skew component to the basic Axes transforms. Additional complexity comes in handling the fact that the upper and lower X-axes have different data ranges, which necessitates a bunch of custom classes for ticks,spines, and the axis to handle this. # interval as appropriate and see what parts of the tick to draw, if any. # spines and axes instances as appropriate. transforms for the data, text and grids. # both axes, in axes coords like before. # Now make a simple example using the custom projection.